Whether you’re the type to lean on thousands of years of Ayurvedic practice or the 3,500+ studies on PubMed – or both – there’s no denying that turmeric is one of the most fascinating botanicals out there. Its health and beauty applications have been celebrated for thousands of years, and now research is supporting many of those traditional uses. 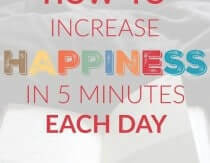 I’ve already shown you how to whiten your teeth naturally with turmeric and use it to support a healthy oral microbiome, so today we’re going to cover skincare. 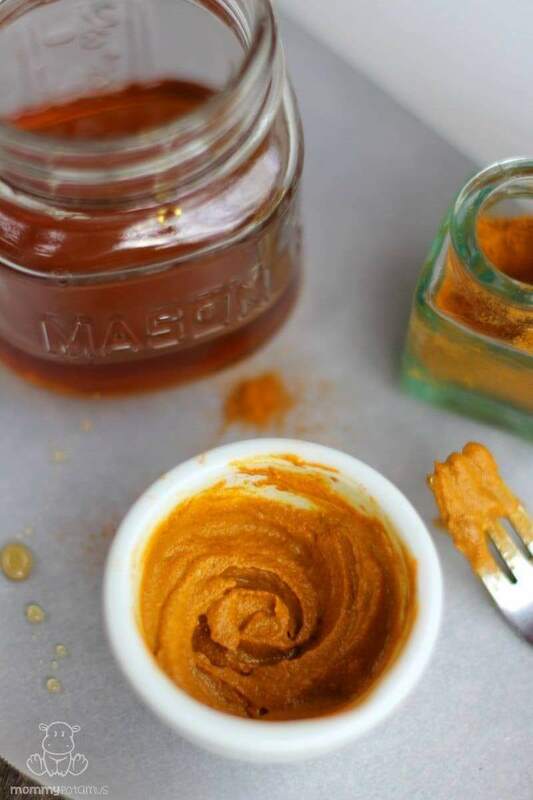 In this recipe, I’ve paired it with two of my other favorite face mask ingredients – both which may be in your kitchen right now! Turmeric is rich in an antioxidant called curcumin that “inhibits collagenase, elastase, and hyaluronidase.” (source) Now, you may be wondering if that’s a good thing. It is! Collagenase, elastase and hyaluronidase break down collagen, elastin and hyaluronic acid – all things we want because they keep skin looking youthful. Collagen is made up of strong fibers that provide structure for our skin, while elastin fibers allow it to “snap back” into place like a rubber band. Hyaluronic acid is a polysaccharide that keeps skin plump and moisturized – obviously something we want as well! An extract of turmeric containing curcumin has also been found to even skin tone, while other research has found it to be helpful for healing wounds and soothing skin irritations. (source 1, source 2) The extract was used because researchers were concerned about whole turmeric staining the skin. Later on in this post I’ll show you how to use whole turmeric without staining. Raw honey contains enzymes that work as a skin clarifier, breaking the bonds of dead skin cells so they can easily be rinsed away. It’s also an emollient and humectant that possesses anti-aging properties, says this study. One of my favorite things about honey is that its pH is around 4.5, making it ideal for delicate facial skin. 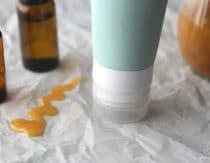 Also, as I mentioned in this salt glow scrub recipe, honey contains gluconic acid, a mild alpha-hydroxy acid that helps brighten and even out skin tone, plus antioxidants that neutralize damaging free radicals. Yogurt can do amazing things for your face, just ask this mom who photographed herself while using it as a cleanser for a week. It contains lactic acid, which like the gluconic acid in honey is is a mild alpha hydroxy acid that helps brighten skin and even out skin tone. 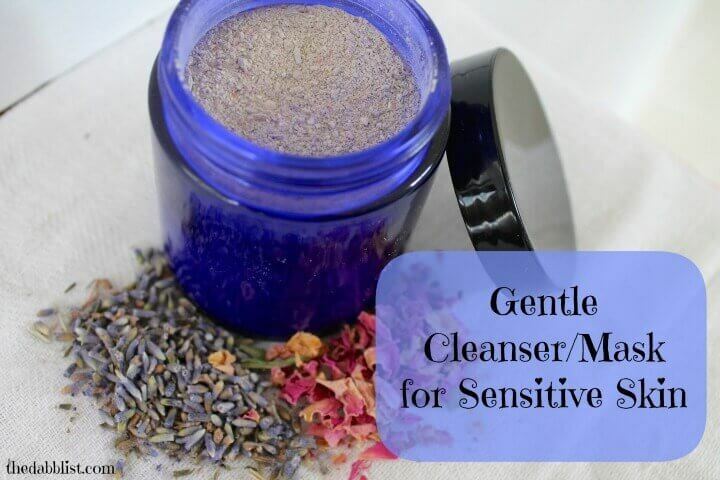 It’s also moisturizing and rich in beneficial bacteria that may help balance the skin microbiome. It can, but there’s a way to avoid it. Turmeric has long been used to dye silk and wool, so it’s no surprise that some cases it can temporarily stain skin. However, I’ve found that after applying and rinsing the mask, any remaining color will disappear when I apply a little olive oil or avocado oil and then wipe away the excess. Optional addition: Olive oil or avocado oil to apply following the mask. Put on an old shirt that you don’t care about just in case the mask drips onto it. Apply to clean, moist skin using your fingertips or a makeup brush, starting at your forehead and going all the way to the bottom of your neck. I prefer to use the brush to avoid getting the turmeric under my nails. Allow the mask to set for about 20 minutes, then rinse away with warm water. Make sure to use a very dark washcloth or one that don’t mind developing a having a bright, sunny tint. If your skin still has a slight tint, apply some olive oil or avocado oil and wipe away the excess. You’ll find that the color goes with it. Enjoy your soft, radiant skin! Can’t wait to try this! I love using raw honey on my skin. Every now and then I apply just the honey as a mask, and rinse in the shower. So can’t wait to try it with the turmeric. I buy cheap black washcloths at Target when they have all the stuff for college dorms. They are great for makeup removal and messy projects like this one! Excited about trying this!! What kind of turmeric should I used?? Yes I too have the same question. How often can I use this mask I have very dry skin. Thanks in advance mommypotamus? I added the blessed black seed oil pure extract to my homemade turmeric mask, amazing results! I will definitely be trying this on my mature, hormone starved skin. Can pumpkin seed oil be used in place of olive or avocado? Yes, You Most definitely can use pumpkin. Hey i need a good website for containers for the scrubs. Personally love using turmeric in face masks as well! Great recipe you have there 🙂 For mine, I add in a little tea tree as well to boost the anti-acne/blemish effect. Hello, thanks for great tips. I normally use turmeric-honey-olive oil on my face. But how can I wash them off? Is using only warm water enough? My face is still very oily after that. Or did I use too much olive oil? Thank you again! 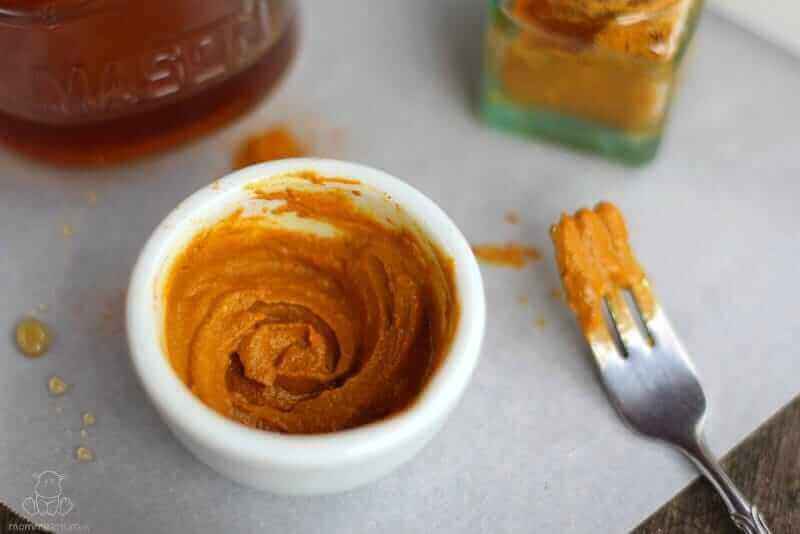 I love this turmeric and honey recipe, and I just have a little concern. Will the turmeric stain be difficult to remove? I don’t want to look yellow or something haha. Can I store this for future use? If so, how long and how do I store it? Thanks for sharing! Oh my lanta, i laughed so hard at this comment!!!! Hahahaha ??? The turmeric used for cosmetic applications is not the same varietal as the one used for therapeutic purposes. And the cosmetic one (which is the major component in Indian uptans / face masks) doesn’t stain heavy yellow. But then, it is also mixed with sandalwood powder. Just FYI please. Using the regular turmeric won’t be as much effective as using the cosmetic one. Try adding chickpea flour to the mix and use just 1/8 tsp of turmeric powder. It doesn’t stain that way. 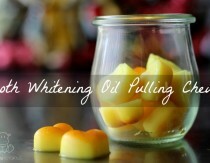 It will leave your face a little yellow:) So better to do it at night. First and foremost, I love your site! Truly appreciate all the hard work you put into it! The turmeric face mask is really beneficial for skin. It’s a natural beauty face pack, without any side effects to skin. Thanks for sharing its recipe. You can clean off the yellow stain with whole milk. Thanks so much for this recipe! Just one thing I don’t understand – if I use olive/avocado oil to remove the tint, won’t that just leave an oily (and possibly olive-smelling) slick on my face? Kinda seems like trading in one problem for another. FYI – I just tried it using slightly less turmeric than the 1:1:1 ratio. It visibly calmed and softened my skin but left a tint. So I washed with my regular face cleanser, which got rid of the tint, but after two successive rinses/washes my skin was irritated again. I admit I probably used too much cleanser though. Basically my question is – what’s the best way to use this mask with few or no further steps? I’ll try further reducing the turmeric, cleaning with whole milk as Danielle suggested. Any other suggestions? Or is cleaning with olive oil not as bad as I think it is? I’m a 36 year old man with combination skin (oily but sensitive and prone to redness).